Transport yourself back to the seductive eras of Art Deco – the lavish designs, the beautiful people, the world totally different from the world today. This slot game is classic, simple, pretty to look at and easy-to-play, which is sometimes all you want (and need) from an online casino game. This game was co-designed – Just for the Win and Microgaming combined their tech and gaming know-how to produce this five-reel, nine payline slot. We know a lot about Microgaming, they’ve been around since 1994 and they’re a big player in the online casino world, but what about Just for the Win? They’re a new Swedish game developer (they released their first game in 2017) but quickly joined up with tech goliath Microgaming. Look out for more of their slots soon, for now, try out Goldwyn’s Fairies and Lucky Links to try out their clean-cut, entertaining style. As mentioned, this is a five-reel, nine payline slot game and it’s pretty straight forward. The symbols are classic and old-school, but the graphics certainly aren’t – giving this game a very stylish finish. You’ve got watermelons, cherries, bells, lemons, diamonds, 7s and peaches – all with a glitzy diamond twist. The highest paying symbol is the diamond, of course, with a 1000 coin win if you match 5. Wild Symbol – the diamond is the big payer, but it’s also the wild, meaning it substitutes for any other symbol on the reel to make a winning combo. Plus, if you land between 2-4 of these in one spin you’ll also trigger the respin feature, where you’ll get one free respin. Land another diamond in that spin and you’ll get another free spin, and this continues until you no longer land a diamond. Bonus Wheel – the wild also triggers the bonus wheel feature, which happens when you get between 3-5 diamond symbols in one spin. You’ll get a respin, where the existing diamonds will remain sticky, until you no longer land any more diamonds. Then the Bonus Wheel round will begin. Depending on the amount of diamond symbols you initially landed, you will be entered into either Silver, Gold or Diamond level. Each wheel has different cash prizes and multipliers on it – the higher the level, the higher the prizes. But you can level up in the lower levels to reach the diamond level, where the top prize is a pretty sweet 1000x your stake bet! 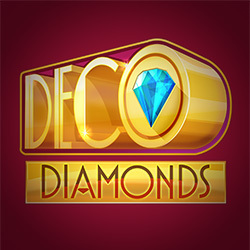 A simple game with some pretty great payouts – especially in the Bonus Wheel round, Deco Diamonds is bringing it back to the classic days of the casino.